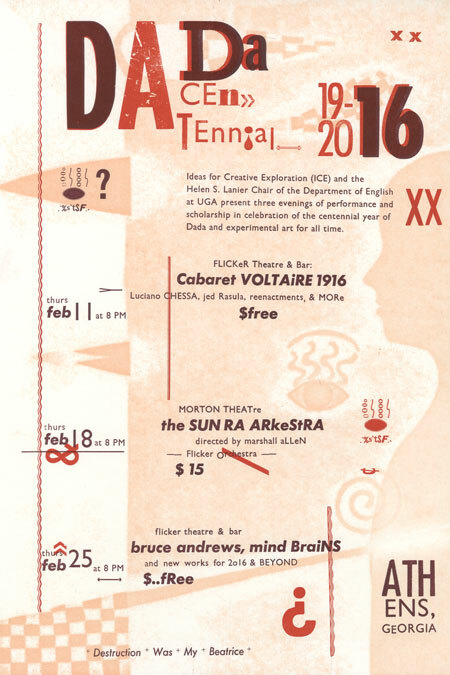 Three evenings of events to celebrate the centennial of Dada, an artistic phenomenon that began in February 1916 at the Cabaret Voltaire in Zurich, Switzerland and spread around the world! Although the venue where Dada was born closed after only four months and its acolytes scattered, the idea of Dada quickly spread to New York, where it influenced artists like Marcel Duchamp and Man Ray; to Berlin, where it inspired painters George Grosz and Hannah Hoch; and to Paris, where it dethroned previous avant-garde movements like Fauvism and Cubism while inspiring early Surrealists like Andre Breton, Louis Aragon, and Paul Eluard. The long tail of Dadaism can be traced even further, to artists as diverse as William S. Burroughs, Robert Rauschenberg, Marshall McLuhan, the Beatles, Monty Python, David Byrne, and Jean-Michel Basquiat, all of whom – along with untold others – owe a debt to the bizarre wartime escapades of the Dada vanguard. Flicker Theatre & Bar, 263 W. Washington St.
Flicker Theatre & Bar becomes Cabaret Voltaire 1916 with a performance of Futurist poetry by visiting artist Luciano Chessa, “An Evening at the Cabaret Voltaire” Dada reenactments by students from the UGA Department of Theatre and Film Studies, a performance of Erik Satie’s “Trois morceaux en forme de poire” by UGA Music students Crystal Wu and Emma Lin, a presentation by Jed Rasula, author of “Destruction Was My Beatrice,” costumes, musical surprises, and much more! Visiting artist Luciano Chessa is a composer, conductor, performance artist, pianist and musical saw/Vietnamese dan bau soloist. He is the author of Luigi Russolo Futurist: Noise, Visual Arts and the Occult, the first monograph on Russolo and his Art of Noise. He has been performing futurist sound poetry for more than ten years and teaches at the San Francisco Conservatory of Music. 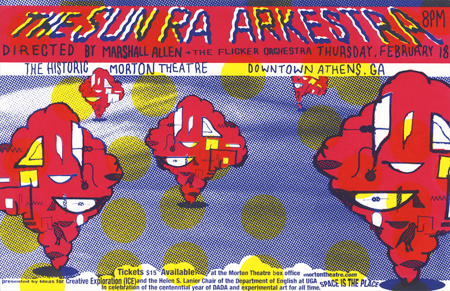 Celebrate the ongoing spirit of experimental art with a rare performance by the Sun Ra Arkestra at the historic Morton Theatre. Athens’ own Flicker Orchestra will open with live soundtracks for vintage experimental films. An evening of new works with visiting artist Bruce Andrews, very short plays by students and faculty in theatre and film studies, compositions by doctoral students in music, and performances by Killick and Mind Brains! Born in Chicago, Language poet and political scientist Bruce Andrews earned a BA and MA from the Johns Hopkins University, and a PhD from Harvard University. He moved to New York in 1975, where with Charles Bernstein he co-edited L=A=N=G=U=A=G=E magazine from 1978 to 1981. Andrews has published dozens of poetry collections including I Don’t Have Any Paper So Shut Up (or, Social Romanticism) (1992) and Designated Heartbeat (2006) as well as several essay collections. Killick Hinds is an improvising guitarist, composer, and writer living in Athens, Georgia. He plays a variety of unusual stringed instruments with a comprehensive approach to genres known and as-yet-unlabeled. Mind Brains are an experimental indie rock supergroup with ties to Elephant 6 collective bands Olivia Tremor Control, of Montreal, the New Sound of Numbers, Dark Meat, Marshmallow Coast, the Music Tapes, and more. 3-color 11″x17″ silkscreen poster designed and hand-printed by Ry McCullough available at ICE – $20 while supplies last!